My first temari really sucked. 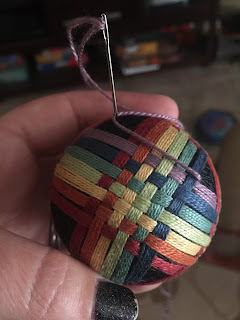 I hadn't learned yet about properly marking divisions, winding thread so that it doesn't unravel into a tangled mess, and laying out a design properly. 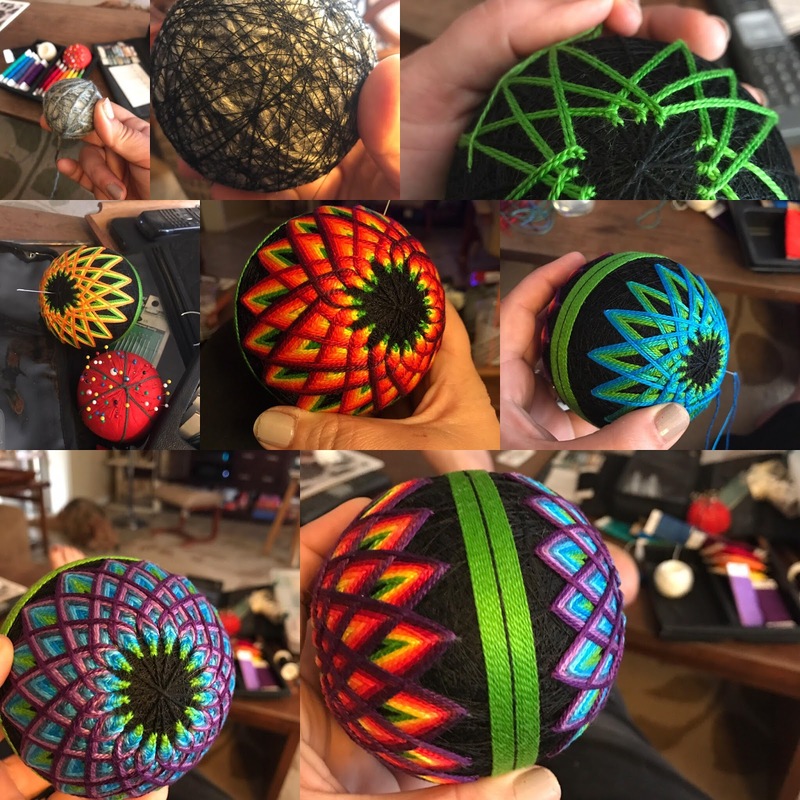 Geometric patterns on a sphere are NOT to be eyeballed. As is the case with tile setting, a very small variance on one end of a project turns into a very large glaring mistake. I learned those lessons the hard way (and am still learning them). I do love making them, and I've embraced the process of learning, of making mistakes, of starting slow and enjoying the ride. This is my second temari, with a much simpler basketweave design (that still has quite a few minor errors). 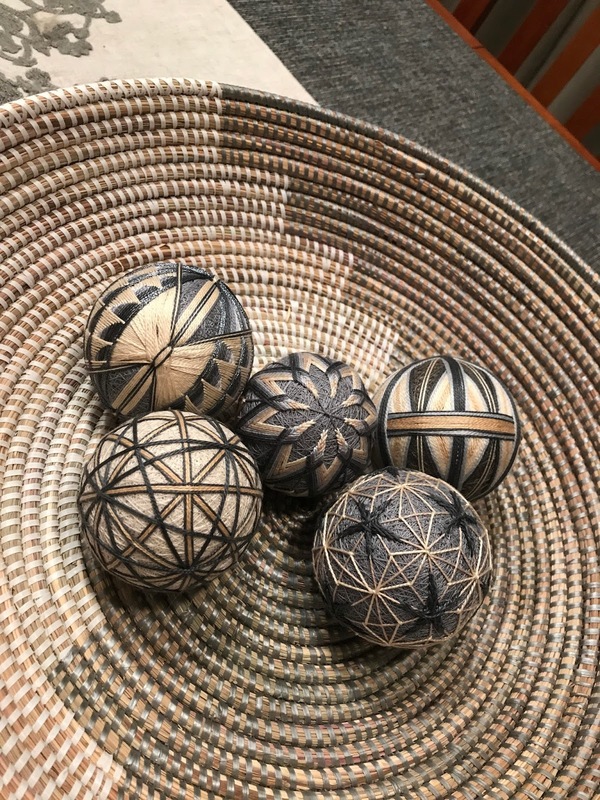 Instead of the traditional rice hull (or fabric) core, I've been using glass marbles as the core to my temari, and it gives them a really nice weight. 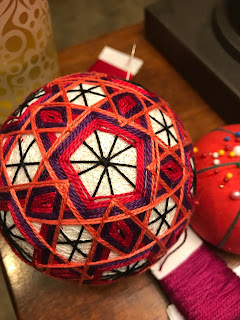 The process of these temari is as follows: I start with the marble (often only a 1" marble), then wrap it in LOTS of yarn to get the mari close to the size I want. Then, I wrap the yarn with a LOT more thread, to completely cover the yarn and to provide a base onto which I can stitch/ embroider the design using perle cotton (it holds together a bit more nicely than embroidery floss). The stitching starts with division lines, separating the mari into 4, 6, 8, 10, or 12 sections. I took pics of a simple Uwagake Chidori Kagari (overlapping zigzag ) kiku (chrysanthemum) design. This is a very common beginner design in temari, with almost endless variations to explore within this technique alone. Most I've kept, and some I've given away as gifts. I doubt I'll ever sell the temari I made, as they are so time intensive, I'm still quite slow, and have a lot still to learn. 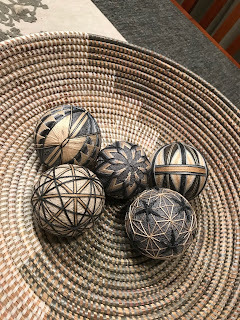 This gray and tan toned set is one I hope to continue building- playing with increasingly complex divisions/ designs, all made to fill a basket that sits on our dining room table.